In SIMetrix/SIMPLIS, a "Device" is the combination of a symbol and an ASCII text model in a deliverable form. The model may be plain text or encrypted depending on the sensitivity of the intellectual property in the model. Models are categorized by type and associated with an appropriate symbol. How to view, edit, and delete model-to-symbol associations. Create a new schematic using the File > New > SIMPLIS Schematic menu. 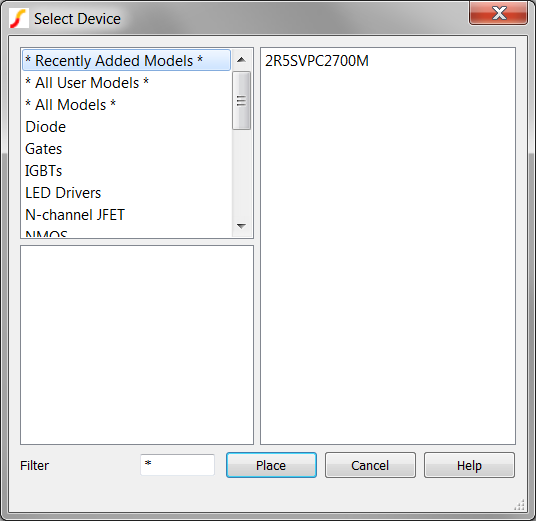 Result: The Select Device dialog opens. In the upper right hand corner is the category box, select NMOS. You can press N twice to select this category. Select the 2N7000 as shown below. Result: The Model Extraction dialog opens and you would normally enter the actual circuit operating conditions in this dialog. Click Extract and place the symbol anywhere on the schematic. You have just placed a nmos_sub symbol based on a 2N7000 model name. In order to do this, there must be a model-to-symbol association which tells SIMetrix/SIMPLIS that the 2N700 uses a specific symbol. In the above example, the 2N7000 is a built-in model, which has a built-in symbol and an association between the model and symbol. For user defined models which you would like to place from the Model Library, you need to associate models with symbols. Embed the association information in the model library file. In this exercise, you will view the model-to-symbol association information for the 2N7000. 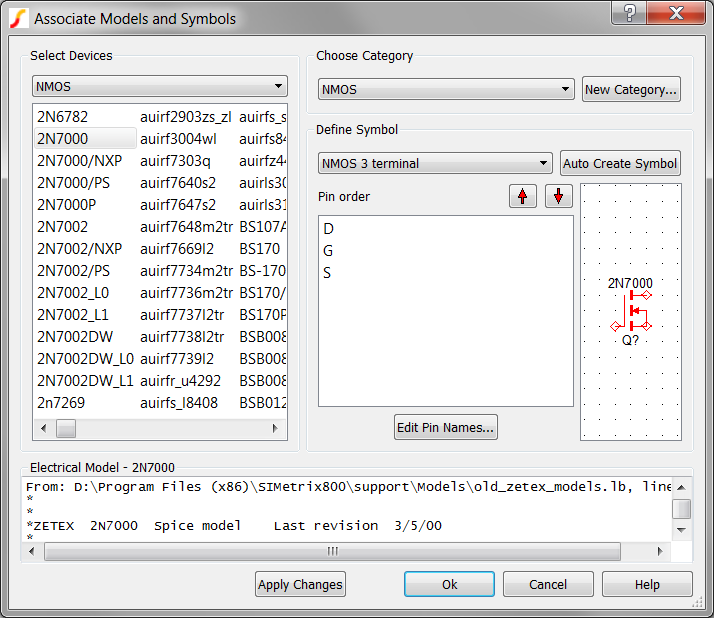 From the menu bar, select File > Model Library > Associate Models and Symbols... . Result: The available devices list is populated with all NMOS. 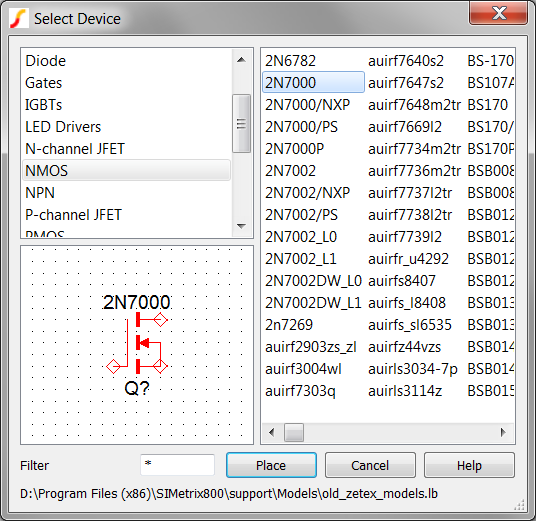 Result: The association information for the 2N7000 model is displayed on the dialog along with a symbol preview. 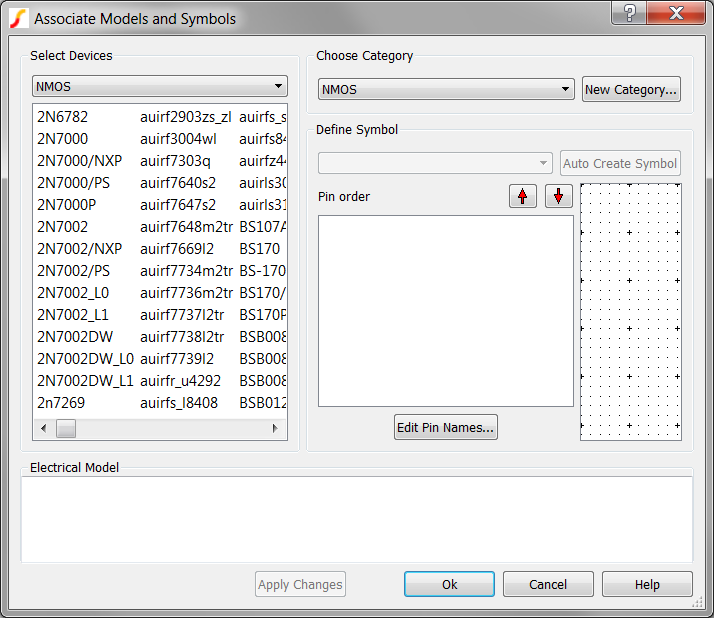 The Associate Models and Symbols dialog allows you to change or create new categories, change symbols, and change the pin order. The Help button on the lower right hand corner of the dialog links to a comprehensive help topic. At times, models are accidentally associated with the wrong symbols. Although no built-in GUI is available for removing associations within SIMetrix/SIMPLIS, you can do this manually with a text editor. The user-defined model-to-symbol associations are stored in a text file named user_v2.cat in the Application Data directory. This is usually located in at the following windows symbolic directory: %APPDATA%\SIMetrix Technologies\SIMetrix800\devdb\user. Drag the user_v2.cat file into SIMetrix/SIMPLIS. Result: The file opens in the text editor. This file stores each model-to-symbol association on a new line. To remove any association, simply delete the entire line. Notice that this is the actual association information for the PSU Controller MAX15062. Important: The *#ASSOC line must be placed right after the .SUBCKT line which starts the model definition. In SIMetrix/SIMPLIS, a Device is the combination of a symbol and an ASCII text model. 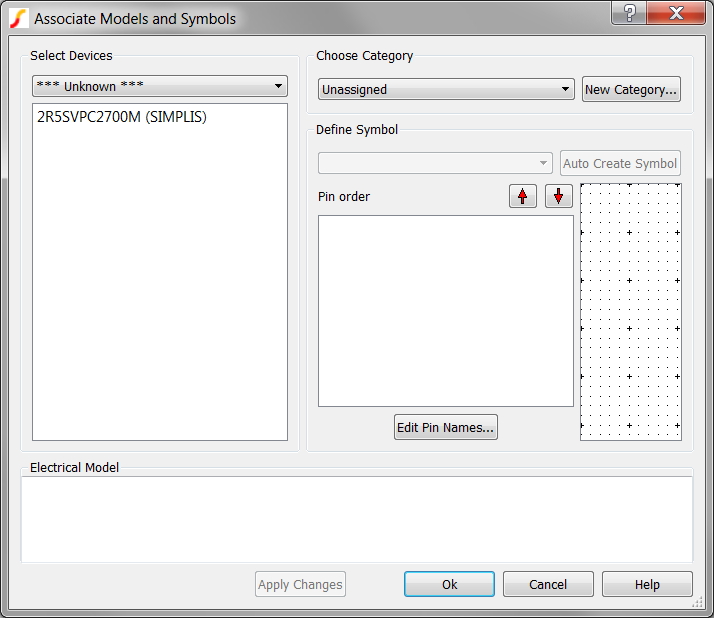 Models are categorized by type and associated with an appropriate symbol using the Associate Models and Symbols dialog. You can embed the symbol name and model library category in the ASCII model library text file using the *#ASSOC comment.